Since 1998 I have taken part for the most part of the years in the San Silvestre Vallecana in Madrid, in the evening of December 31st. That is a great tradition. However, I have not yet shared in the blog another such tradition that I have been taking part in since 2015: running the Corrida de Noël in Toulouse, organized the weekend before Christmas on a Sunday morning. That is another great event, in which around a thousand runners take part in different distances races all dressed up in Santa Claus or Père Noël costumes. This time the circuit of the race took us from the Saint Sernin Basilica on two loops around Capitole, Alsace-Lorraine, Metz, Pont-Neuf, Saint Cyprien, Pont St Pierre and back to Saint Sernin, for a 7.2 km-long race which took me 34’54” to complete. Ailes Anciennes Toulouse is an association that preserves and restores old airplanes and helicopters. It is located in Blagnac, close to the museumAeroscopia. In its collection has over 50 aircraft, some of which are being worked on, some are displayed in their field and others are ceded to Aeroscopia (e.g. the Super Guppy being one of them). About three or four times a year, Ailes Anciennes organizes what they call Visites Cockpit events. In those days, most of the aircraft on display are opened for visitors to enter in them, sit in their cockpits, experience them, get explanations from enthusiast volunteers of the association, walk through their cabins and cargo hold compartments. Last year we went for the first time. See here the post I wrote then about it. Last April 2nd, we went there again (as over 540 other enthusiasts), as it is always a nice experience to walk around those pieces of craft, plus this time we went with my father-in-law. In relation to last year’s visit, this time there was a new restoration hangar, named “Ateliers Louis Breguet” after the aviation pioneer and it was possible to enter into the double decker (“Deux Ponts“) Breguet 765 Sahara, an antecessor to the Airbus A380, designed in the 1940s, introduced in service in the 1950s with 20 units built. Sitting onboard a Sud Aviation Caravelle. Side view of Breguet 765 Sahara. Upper deck of Breguet 765 Sahara. Cockpit of Breguet 765 Sahara. De Havilland Vampire T11 built in France by SNCASE. Cargo hold of Nord 2501 Noratlas. I recommend the visit to Ailes Anciennes in its Cockpit days (10€ for adults). Take a look at their website to see when the next one is scheduled (normally in spring). I discovered Najac literally by flying over on the way to Villefranche des Rouergues (LFCV) during a flight lesson with my instructor back on July 17th, 2014. That day, when I came back home, I immediately told Luca: “we have to go on an excursion to Najac“. Back in April 2015 we made a weekend excursion doing a night stop over in Najac and visiting other nice villages (mainly) around the Tarn river. Luca wrote two nice posts about them with plenty of bright pictures: Najac and Route verte (including Castelnau-de-Montmiral, Puycelci, Bruniquel and Saint Antonin Noble Val). Time passed, and I got my private pilot licence last November (1) and for the first flight with passengers (Luca and Andrea) we decided to go again to Najac. On the way to Najac we would fly by Cordes-sur-Ciel and on the way back we would partially follow that route verte by St. Antonin de Nobleval, Bruniquel, Puycelci… basically the same trip but up above in the air. The flight would be short, as estimated when preparing the navigation. It would take about 57 minutes of flight time plus around 10% to take into account the wind, some more minutes for the integration back in Lasbordes… about 1 hour and 10 minutes (2). Navigation log prepared for the trip Toulouse Lasbordes – Najac. Chart view of Toulouse Lasbordes – Najac. (1) As described here “My path to the private pilot licence (PPL)“. (2) In the end it took 1.37 engine hours (or 1h22′), a bit more than estimated… due to departing Southbound and not having found Cordes-sur-Ciel straight away plust some time spent in circling villages. A couple of weeks ago I asked my flight instructor about destinations for a short flight excursion (from our base aerodrome in Toulouse – Lasbordes), a nearby aerodrome with a nice bar or restaurant with some spots worth to see on the way. At first thought he recommended: Auch, Cahors and Gaillac. I had booked an airplane in the aeroclub for last Saturday some weeks ago and we were lucky again in having good weather for the day, mostly clear and sunny in the beginning. So, at 11:30am we drove to the aerodrome. Destination: Auch. A friend, Rapha, had also recommended Auch and he was going to join us for the trip, but other activities prevented him for being early at the aerodrome. After receiving the keys of the plane a bit late, at 12:53 I was starting the engine. The flight would be rather quick. That was good as we were late in departing and the guy at the restaurant had told us to arrive before 13:30… when preparing the navigation I had estimated the return flight in about 62 minutes, plus some plus 10% due to the wind, plus some 10 minutes per integration and taxing in each aeroport… that woud make it about 88 minutes or 44 minutes per leg. We knew we would not make it (12:53 + 00:44 ~ 13:37) but we decided to give it a try and see if we still were able to get some food. If not, at least we would have trained the crossing of Blagnac’s CTR plus landing in Auch, an aerodrome I had never landed in before. Navigation log prepared for the trip Toulouse Lasbordes – Auch. Transits through Toulouse Blagnac’s CTR. Once you fly over the airport the next highlight of the flight comes: over flying Airbus’ Toulouse facilities, seeing from above the delivery centre, flight line, A330 FAL, A350 FAL, flight test aircraft, Beluga’s, etc., you name it. See a short video filmed by Luca below. You quickly arrive to the Leroy Merlin in Colomiers (point WD) and then turn Westerly towards the Bouconne forest (WF) and further ahead you leave the CTR (at WH). Then you only need to keep exactly a West heading (270⁰) easily aided by Toulouse VOR for about 22 nm (12 minutes at our speed, ~ 115 kt) until you find yourself above Auch aerodrome. Chart view of Toulouse Lasbordes – Auch. We flew the vertical of the airport, integrated the circuit in the cross wind leg, right after another plane which had just taken off. Reduced speed, put the carburetor heating on, activated the electrical pump, deployed flaps in take off position, gave a message with the radio, reduced speed to 150 km / h, trimmed the aircraft and gently proceeded towards base leg, lost some altitude and found ourselves in a final leg with a runway of 1,900 metres to land, four times of what we needed. Final approach to Auch (LFDH). Jean Philippe, a Belgian chef who resonates very much with the charm of the Gers, was cooking at the grill, welcoming guests at the restaurant, picking the phone, giving casual conversations to all customers in all four corners at any time from any place within the restaurant… running the show. The menu… we had not ordered anything and saw the aperitif (kir), water (wine, if we had not refused it), bread, soup… coming to the table. The soup, “carbure” (as I later learned) is a traditional soup cooked with meat and vegetables from the previous meal; definitely the best dish of the restaurant. I then asked how did it work with the menu, the ordering… Jean Francois pointed at a corner: “it’s a buffet, you take the starters there, I take charge of the meat”. The starters included all kinds of salads, vegetables and sea food. We then took some desert (from another buffet in another corner) and to our regret we had to leave quickly back to Lasbordes to try to give back the plane on time for the next pilot. The all-included menu cost 19 euros per person. Check out the restaurant (“Aerodrome d’Auch Lamothe”) and book your table here (phone call). I booked a plane at the aeroclub for 3h30′, but in order to enjoy the trip in a more relaxed way, I recommend to arrive there before 13h and to book a plane for no less than 4 hours (if departing from Lasbordes), to ensure you have time to enjoy the lunch with time enough and so that the departures do not feel like a rush. A couple of months ago I discovered that there was a short race, 10km du Stade Toulousain, that was going to take place close to home. I decided to take part in it. Normally I have to travel or wake up early to arrive at the place where a race starts. This time I could stay longer in bed and I would go jogging from home. I could not skip this chance. However, the date of the race was not the most suitable. It was just a week before Toulouse marathon. On top of it, I had run the 100km de Millau 3 weeks before, and in the following 4 weeks I was trying to train for the marathon and get an idea of how fit I was in order to see at what pace should I run it. In races of 10km I normally try to run all out to see what is the best time I can achieve. In 2014 I collected some personal bests in the distance and several times under 45′. However, I knew I was slower from mid 2015, as the couple of 10k I run in June and July were in the range of 46 to 48 minutes. Reading online in some forums I found people both in favor and against running a 10k all out just a week before a marathon. I found also an interesting idea: take it as a series training. The poster suggested to run it alternating 1 mile at marathon pace with 1 mile all out, 3 times. I found this idea interesting and decided to do something like that. I would run the 10k alternating kilometers running at all out and marathon pace (however, the latter ones I ran them faster than my best time in marathon… and faster than the intended pace for Toulouse marathon). It was a good experience. I thought that it would take me more effort to go each time all out and also to not relax completely but to keep a good pace in between those all out kilometres. I did the fast kilometres at in between 4’20” and 4’27”. The last half kilometre at below 4′ pace. I did the slow kilometres at in between 4’50” and 5’00”. The previous to the last half kilometre at 4’33” pace. Apart from the running experience, it was strange to overtake and be overtaken by the same runners once and again. I would pass them along the third kilometre, they would overtake me along the fourth, and so on… as the race advanced some of the runners I exchanged positions with during the race were not overtaking me anymore, until the last two kilometre, when I finished at a faster pace than the groups I had been running with. Finally, we got a nice t-shirt with the logo the rugby club. 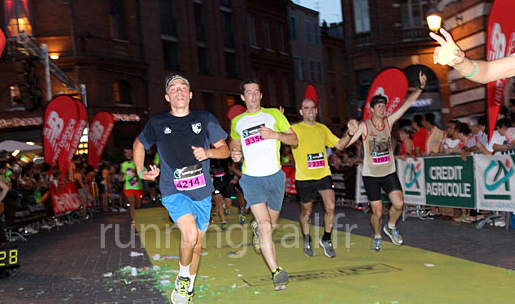 About a month ago, on the evening of July 3rd, it took place the XVI edition of the “Corrida Pedestre de Toulouse“, arguably the most popular race in the region with a participation of about 5,000 runners among the two distances, 3 and 10km (4,089 finishers in the 10km). In the previous post I stressed how satisfying the experience is of running a race end to end in the company of friends. In the case of this race, I was lucky enough to have my friend Jose visiting us in Toulouse (being an aerospace professor, he made a study trip to Airbus during those days). Thus, we subscribed together to the race and we ran it again end to end together (1). Announced circuit for the 2015 edition. Real circuit we followed (note the difference in the second loop). But the essence of the race is kept: very good atmosphere in Capitole square both before and after the race, the chance of running through the main streets of downtown Toulouse (Alsace Lorrain, Saint-Rome, Metz, Quai de Tunis, Pont Neuf, Pont Saint Pierre…) emptied of cars for the occasion. My friend Jose and I finished in the 534th and 535th positions in ~46’19” (that is among the first 13% runners; though that is aided by the amount of casual runners who take to the streets on this day). That is about 3 minutes slower than it took me last year. Jose and I running the last metres (right side of the photo). Within Airbus, we also arranged a team of above 30 runners to take part in the race, with the result of winning the companies challenge with accumulated time among our first 5 runners of 3h20’27”! (1) To be honest, I lost him at the km 7 when he took some 10 metres of advantage that extended to some 50m by the 9th kilometre, but he then waited for me so we effectively completed the last stretch together again. (2) In the previous years there had been complaints that the circuit was shorter than 10km. That had also been my experience (9.63km).